HootSuite, the Twitter clients that dubs itself as a social media dashboard for professionals, is launching an Android app, a new version of its iPhone app with Facebook integration and is integrating targeted ads in both apps via recently launched Twitter ad network, 140 Proof. HootSuite’s features are targeted towards helping marketing professionals keep track of the Twitter conversations happening on the web. The startup offers a free and paid version of its web app, and mobile clients. The Android app features much of the same functionality as the iPhone app, including the ability to manage multiple Twitter account, create streams for hashtags and searches, schedule messages for the future, add followers to lists and accounts, share photos and shorten URLs. The paid versions allow for unlimited Twitter accounts plus on-board, click-through statistics tracking. The updated paid version of the iPhone App will include Facebook integration and landscape view. And in an effort to boost revenue, HootSuite is partnering with 140 Proof to serve ads on all versions of its mobile offerings. 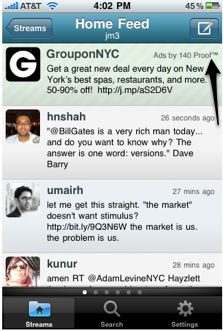 Ads are served within users’ Twitter streams on and are clearly marked as ads, but act as Tweets that can be retweeted. HootSuite is taking the advertising risk on 140 Proof because the startup promises highly targeted advertising. Twitter clients pass 140 Proof a user ID list (with no names) and the public information contained in a Twitter users profile, and on the advertiser side, advertisers bid on ads to be directed toward users based on keywords in tweets, followers, as well as device, location and platform. 140 Proof’s algorithms calculates Twitterer’s “persona” based on public tweets and who they follow and serves ads to users based on this data. The deal with HootSuite is a big coup for 140 Proof, which just launched its network a few weeks ago. OneRiot is doing something similar with its realtime ad network RiotWise, and is seeing promising results during its private beta. And we are anxiously awaiting Twitter’s new advertising model which may or may not be revealed in the near future.